Interesting isn’t it? This is an ice cream advertisement that appeared in Russia. Clearly their sense of humor is a little different from an Americans. This ad features President Obama, and advertises chocolate with vanilla flavor. Comparing chocolate ice cream to an African American’s skin color is considered offensive in the United States. An African American might become quite offended with this comparison, due to stereotypes that has followed them since the abolition of slavery. The Huffington Post didn’t find this ad to be as audience appealing in the US as it is in Russia. What is it about Europeans, or Russians, more specifically, that have a more matter of fact way of presenting things? This ad would not be okay to present in the US because it would be seen as racist. In Russia though I’m sure many people are humored by this and sales would most likely go up. I mean who wouldn’t want to get a hold of this novelty ice cream wrapper? Furthermore, Americans also make fun of Prime Minister Putin and President Medvedev. Is it only fair to be poked fun at back? To get an idea of how sensitive Americans are to this issue, The New York Times wrote an article regarding businesses in their community that incorporate Obama’s name into signs. One fried chicken restaurant is named Obama’s Fried Chicken. Many people in the community are outraged but others think that many are too sensitive. People in the community argue it is because Obama is so well liked, while others think it is pure racism. What about this ad that is featured in Germany? 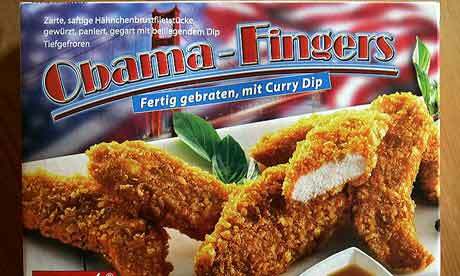 It is called Obama Fingers and features breaded chicken fingers with curry sauce. Once again in the US this ad would be seen as offensive because of the stereotypical association of fried chicken and African Americans. In Germany they do not seem to have a problem with it though since it is merely another product. Is this a way to joke about the US president, or is it simply a clever advertising technique? Check out the site and decide for yourself. If other cultures are ignorant to American stereotypes should they still be held accountable? This entry was posted in German, Russia and tagged Obama Advertising.